This delirious 1925 Jazz Age classic introduced readers to Lorelei Lee, the small-town girl from Little Rock, who has become one of the most timeless characters in American fiction. Outrageous and charming, this not-so-dumb blonde has been portrayed on stage and screen by Carol Channing and Marilyn Monroe and has become the archetype of the footloose, good-hearted gold digger (not that she sees herself that way). For the next installment of the Trylon Book Club, we present Anita Loos’ 1925 novel Gentlemen prefer blondes: The Intimate Diary of a Professional Lady, followed by a special Saturday morning screening of Howard Hawks’ 1953 show-stopping musical with Marilyn Monroe. We’ll follow the screening with our own choreographed Technicolor conversation about both at the bookstore right next door. Moon Palace Books has copies of Loos' novel available now. "Gentlemen prefer blondes" will screen November 7-9 at the Trylon. Extra-credit for reading the sequel, But Gentlemen Marry Brunettes, which is included in the paperback edition at Moon Palace Books! Show your Moon Palace Books receipt at the Trylon and get in for $5 at the Saturday morning show (discount not available at other shows). "Gentlemen prefer blondes" also screens Friday-Sunday nights at the Trylon (regular and punch-card admission applies). Anita Loos is currently considered a "single author." If one or more works are by a distinct, homonymous authors, go ahead and split the author. 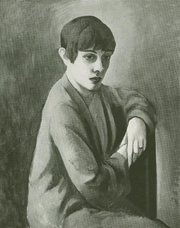 Anita Loos is composed of 3 names. You can examine and separate out names.